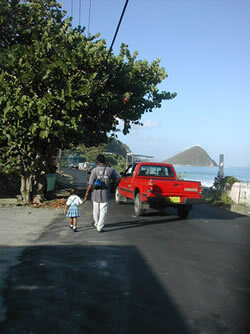 Little Apple Bay, Tortola, British Virgin Islands--Where did this year go? Last January many of you took a fifteen-minute walk as part of our devilishly easy "Walk with Remar" exercise program. One person walked only one block in fifteen minutes. Forty-eight weeks later, a planeload of you (including the person who walked only a block) is actually coming to Tortola to walk a country! Okay, not the entire country, but to walk the length of Tortola, the biggest of our 46 islands, a round-trip walk of twenty-four sheer, mountainous miles. And, okay, some of those coming are only walking nine miles. But could you do that? The British Virgin Islands isn't a bad place to walk in early December, either. Walter Cronkite calls this hundred square miles "God's gift to Humankind." Mr. Cronkite has been coming here thirty-seven years, and he should know. Cronkite, along with ABC World News Tonight anchor Peter Jennings, Jean-Michel Cousteau, Winthrop Rockefeller, George Plimpton, and others, serves as a Governor of the Trustees of the BVI National Parks, USA, a non-profit U.S. Foundation that supports the Park's preservation efforts. But all those big names pale in impressiveness compared to two realities about the impending visit of the beltway crowd. First, even the gourmet travelers in our group will be amazed by this country and its people. I rolled out of bed at 5 a.m. this morning, brewed a cup of French decaf, and struck off along the North Shore Road. I've written about this stretch of road before and traveled it by car or foot hundreds of times in a dozen years. It never changes much thankfully: three cars passed me in three and a half hours of walking (I encountered some chickens and six goats, too). A traffic jam of sailboats, clustered around mountainous islands, packed the near horizon. Halfway through the walk, a stooped, elegant lady in her eighties emerged from her cottage overhanging Cane Garden Bay and chatted with me amiably. The lady was thankful for the previous evening's rain, which had both filled her cistern "and helped my friend," she said with a wonderful West-Indian lilt, her hands gesturing towards a giant loblolly tree. "It's been so thirsty." This woman in her true dignity embodied an old saying here, "We know who we are." She would have been as comfortable talking with the Queen of England, whose family and royal retinue have been coming here for a hundred years. But the lure of these islands is not as impressive as the real meaning of the walk. It doesn't matter if you're walking in the nippy winter of the beltway or across our little patch of paradise--if you have increased your exercise even an inch during the past year, you have seized the slippery horns of inertia and wrestled the beast to the ground! Who cares if you can't climb Everest? Rita O'Brien, a wise walker from Hampton, Virginia, has it right: "My theory is this: Life is short, and I may as well tackle a foothill, if I can. Next year, the mountain." After seven months of training, Ms. O'Brien was ready to tackle the mountain, too. "With great expectations I was ready to hike the full twenty-four miles," she says. "Then I slipped and fell in the kitchen." She is coming to Tortola, anyway. "Though injuries keep me from training, and though I'm way behind, Im going to walk a short distance, regardless," Mrs. OBrien says. Excellent. Returning from my walk this morning, I came up behind Naldo Scatliffe and his five year-old daughter, Khyjah. [correct] The two, hand-in-hand were ambling about a mile along the ocean from Carrot Bay to the Leonora Delville Primary School in Apple Bay. You see this scene countless times in the British Virgin Islands where parents are pretty serious about their children's education. The sight of the Scatliffes, hand-in-hand, reminded me of the discrete way native BVIslanders describe "off-islanders" like me: "Have you met the Smiths in Apple Bay?" a local might say, then adding one of two phrases, "They live by us" or "They live with us." The first phrase means youre an outsider; the second brings great honor. Our planeload of beltway walkers is going to live "with" BVIslanders for seven full days. Dozens of my local friends are helping host them. But you can live with us on this walk, at least in spirit. On Saturday, December 7, round up some friends, and take a walk! Then email me with your experience and a picture (to conchteam@aol.com), and we'll post it on our web site, right by the pictures of the suntanned beltway crowd here in Tortola. Isnt it time now to go see what shape your walking shoes are in? Want to see what Cronkite and Jennings and others really think about the British Virgin Islands? Go to www.bvitrustees.org.